HARMAN’s Martin Professional announced the pre-order availability of their new M-DMX interface hardware for connecting lighting software and DMX universes as well as several new controller solution bundles, including the M-PC 2U bundle and the LightJockey 2 and M-PC+ Controller kit. 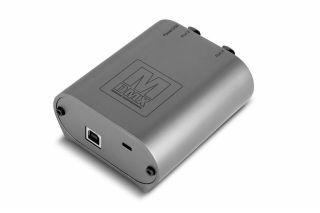 The Martin M-DMX is a rugged aluminum extruded device and is built with two XLR 5-pin DMX ports, a USB 2.0 connection and a K-lock slot for securing the device. The interface also features a stackable design, LED indicators and isolated dual output. The M-DMX is compatible with Martin’s LightJockey and M-PC software, M-Series Consoles, Fixture Upload software, and is backwards compatible with Martin’s Duo-DMX interface. Martin’s M-PC 2U is a professional two-DMX universe package, bundling Martin’s M-PC software and the M-DMX two-port DMX interface. As the latest entry to Martin’s renowned M-Series family, the M-PC 2U bundle is the a cost-effective lighting software. The new LightJockey 2 and M-PC+ Controller kit combines Martin’s LightJockey, M-PC, and ShowDesigner software into a single package. The bundle comes standard with a Martin M-DMX device, a Martin One-Key license dongle with M-PC+ (four universes) and a LightJockey 2 four-universe license as well as a Martin ShowDesigner 6 Lite six-month trial license. Martin has also introduced a new license set that expands the M-PC+ license up to 128 universes. “Our customers will experience flexibility and benefit from the modern, rugged design of the Martin M-DMX, and the M-PC2U is a very cost-effective controller solution,” said Paul Pelletier, Product Manager for Controllers.